Are you sporting an InvisibleShield? If you aren’t, then you’re missing out on one of the best iPhone skins available. 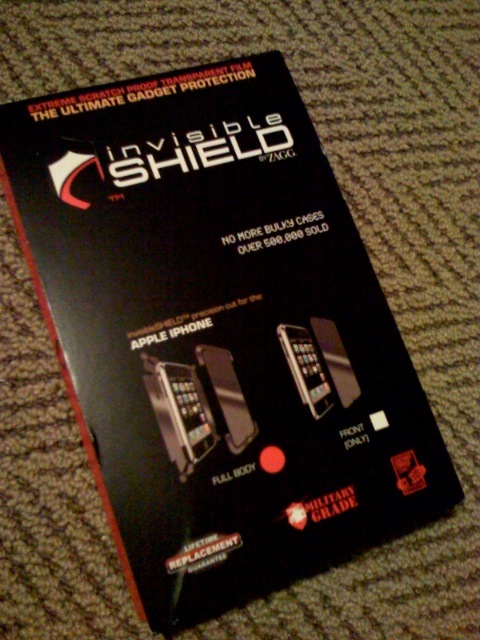 I reviewed the InvisibleShield just over a month ago and it’s been on my iPhone ever since. No problems so far and things are going great! With a lifetime warranty, I will most likely continue to use them forever. Anyways, as you maybe remember with my BestSkinsEver review, I ended up giving away EIGHT skins! Well, at the time of my InvisibleShield review, I had not received the extra package in the mail from ZAGG. For those still waiting (I know you have remembered), the day has finally come. That’s right baby, it’s InvisibleShield Tuesday and here is your chance to win a FREE InvisibleShield ($24.95US value)! How to Enter My InvisibleShield Contest Giveaway! Leave a comment on this post (with a working email)!